Search for the best flight prices from Manchester to Budapest. Compare prices, book today and save money with Manchester Airport. This awe-inspiring Imperial-era capital has it all... monuments and public buildings to inspire, parks to relax in, a wide river to cool off by... and a pulsating nightlife to rival anything the old 'west' can offer. 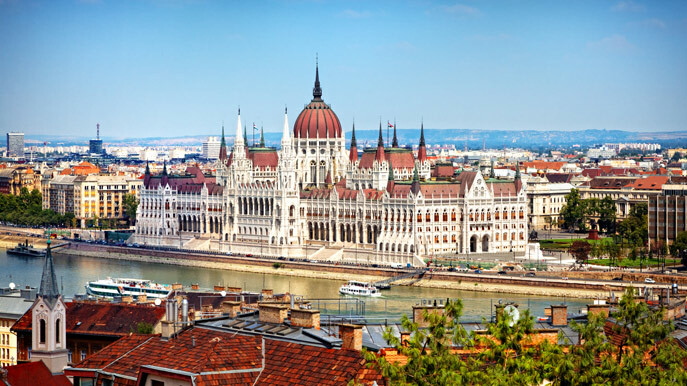 Visit Budapest and discover not one but two cities with culture and civility at their core. Budapest is no stranger to magnificence, and its leading hotels are suitably grand. The 359-room Kempinski Hotel Corvinus Budapest (Erzsebet ter 7-8) offers five-star luxury close to the sweeping vistas of the Danube River, while the even better positioned Four Seasons Gresham Palace (Szechenyi Istvan ter 5-6) has a location right in front of the Chain Bridge. The still-fresh, three-star Bo18 Hotel Superior (Vajdahunyad utca 18) has drawn plaudits since opening in 2011, while for those on a budget, Yep! Hostel (Wesselenyi utca 13) provides simple accommodation units on the Pest side of the river. There's much for shoppers to enjoy in Budapest, with a surplus of folk art souvenirs (some of them of an excellent quality, others markedly less so), a good supply of market halls and some genuinely high-end outlets. For the latter, Andrassy ut (avenue) and the cafe-thronged Vaci utca are both good for big-name brands and designer labels, as is Deak Ferenc utca, often referred to as 'Fashion Street'. There are plenty of good markets, with the fresh food and tourist souvenirs of Nagycsarnok (Fovam ter) helping to make it the largest indoor market hall in Budapest. For first-rate antiques, meanwhile, there's no better street than Falk Mitsa utca. Hungarian food is traditionally homely and filling rather than gourmet - think goulash, paprika stew or dumplings - but this fact doesn't prevent Budapest from offering some excellent places to eat. Among the most notable restaurants are Onyx (Vorosmarty ter 7-8), where the stylish decor is matched by a modern menu (veal tenderloin with tuna tataki, anyone?) and the defiantly lavish Arany Kaviar (Ostrom utca 19), which specialises in, yes, caviar. For something more authentically Budapestian, the city's best cafes are an excellent bet, with the likes of Ruszwurm (Szentharomsag utca 7) serving up warming helpings of coffee and cake in old-world surrounds. The famous literary festival on the Wales-England border has held an edition in Budapest since 2012, hosting a wide range of readings and debates from an international range of writers, novelists, poets and speakers. A 10-day-long music and dance festival with a focus on both Hungarian folk arts and Budapest's multiculturalism, the Danube Carnival draws hundreds of artists and performers from around a dozen different countries. Only in existence since 2011, this four-day festival has already earned a sterling reputation among beer lovers. Visitors can choose from some 200 brews, and its grand setting in Buda Castle only adds to the occasion. Held across three months and making use of the picturesque open-air stage on Margaret Island - as well as a number of other venues - the Budapest Summer Festival combines opera, ballet, world music, exhibitions and orchestras. The Formula One circus comes to town once a year, with the race at the Hungaroring (a short drive from Budapest) established as a mainstay of the Grand Prix Calendar since the 1980s. Qualifying takes place on the track before the day of the race itself.